There will be millions of people celebrating a day we all call “Christmas.” Many will be spending time with family and friends as they open gifts, eat, and partake in countless traditions. The festive activities that come with this time of year are joyous for many and disheartening for others. As a result, people respond to the Christmas holiday in different ways often depending on their emotional factors. The factors that underline such differences are countless. In considering of this, I found myself concerned for the numerous people that are currently distraught or will be discouraged for their respected reason. The initial response I had upon thinking about the many disheartening things that people are facing is the greater need for physical solutions for the problems being faced. Before it finally clicked that the real underlining need for so many people is their need to come to Christ or return to Him for a true resolution to the many problems being faced. It is through reflecting upon this that I began to consider the importance for us to take the time to think carefully about the Christmas story beyond it simply being a birth narrative. I found it imperative to spend time meditating over the narrative contained in Matthew 1 (vv. 18 – 25). It seems that much of this narrative, at least to me, about Christ’s birth, is engraved into our minds and social construct. The significant point of this story is often glossed over with our cultural chronicle that revolves not around Christ but gifts, food, and countless traditions. This is not about putting down the various things we do during Christmas. I am sure many of us have placed value on having much needed time away from the regular hecticness of life and participating in such various activities with our loved ones. The point being made here is not to stop doing such things but to remember that Christmas in light of the birth of Jesus reminds us that humanity cannot save itself. Let us not forget “what we celebrate at Christmas is not much the birth of a baby, but the incarnation of God Himself (R.C. Sproul),” as we celebrate in numerous ways that He humbled Himself for our benefit. The essence of the incarnation is about God reconciling the severed relationship between Himself and humanity (Cf. John 3:16-18). The nature of human depravity began early in our history. It resulted in a severed relationship between God and mankind (Genesis 3) that we are unable to resolve on our merit (Romans 3:23; Romans 3:10; Romans 5:12). This separation has left us having to pay retribution for our transgression. The retribution for our sins is death unless we accept God’s gift of salvation through Christ (Romans 6:23) that He has offered us as an expression of love despite our sin (Romans 5:8). It is through the offering of this gift that we are saved and justified by our belief (Romans 10:9 – 10) as we are saved by calling upon His name (Romans 10:13) in response to faith in hearing His Word (Romans 10:17). I always wonder if Mary understood or even knew what her Son would do for humanity whenever I find myself pondering about the significance of Jesus’ birth. As I consider this, I always end up dwelling upon this song. I implore you to take the time to listen and think about the lyrics. 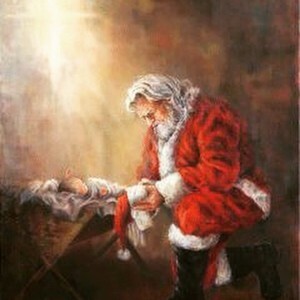 I hope and pray that every person that comes to this post has a blessed and merry Christmas.